Home Oh My God Festival Why Dev Diwali is celebrated? Here the interesting Religious story! Why Dev Diwali is celebrated? Here the interesting Religious story! Dev Diwali or Dev Deepawali is the ‘Festival of Lights, of the Gods’ or ‘Diwali celebration of the Devas or Devtas or Gods’. It is observed on the full moon day (Purnima) in the month of Kartik, as per the traditional Hindu calendar. It is also called as Kartik Purnima / Poonam and Tripurari Purnima. Dev Diwali is celebrated to honour the victory of Lord Shiva over the demon named ‘Tripurasur’. For this reason, this festival is also known as ‘Tripurotsav’. It also coincides with the Jain light festival and Guru Nanak Jayanti. Dev Diwali is celebrated in a grand manner across the states of Gujarat & Uttar Pradesh primarily and also in some sections of North India by communities. Certain communities also celebrate Tulsi Vivah or Tulsi Puja on this day. In the state of Maharashtra, Dev Diwali is observed on the first day of the month of ‘Margashirsh’. Kartik Purnima celebrates the power of Lord Shiva. Further, it is believed that Gods descend from heaven to bathe in Ganga on this day. Dev Diwali is hence celebrated. On this day, thousands of Diyas (earthen lamps) are let to float in the holy water of the Ganges, paying respects to the Gods who have descended. This is a traditional ritual which has been in practice for long. Why is Dev Diwali celebrated? Kartik Purnima celebrates the power of Lord Shiva. It is believed that the Lord Shiva killed the Demon Tripusara on this day, thus the day is also known as Tripuri Poornima or Tripurari Poornima. Tarakasur, a demon, had 3 demon sons- Tarakah, Kamalaksh and Vidyutmali. He got three moving cities which were made of Gold, Silver and Iron constructed from Mayasur- the renowned Architect of Demons. He gifted one city to each son along with an advice not to cross the paths of Gods or disrespect them. All three sons performed severe penance to Lord Brahma, who granted them a boon that they would live for thousand years in their three invincible moving cities called Tripuri; and that they could be destroyed by only one arrow that would merge the three cities, into one and set them on fire. Shortly the three sons started harassing Gods. The Gods then approached Lord Shiva to seek help, for their rescue. Lord Shiva danced the ‘Tandava’ – ‘The Dance of Destruction’ , that rocked the three cities. He shot an arrow piercing through the three cities at one time and the fire from his third eye burnt the three cities. The killing of the three demons spread happiness around the world . This form of Shiva is called ‘Tripurari’ or ‘Tripurantaka’. This great victory is believed to have happened on the full moon day in Kartik month and hence the day is celebrated as Tripuri Poornima or Tripurari Poornima. How is Dev Diwali celebrated? This religious ceremony is started by chanting of the holy Vedic mantras by the priests, lighting diyas at the ghats and a sparkling display of firecrackers, to welcome and please the Gods and Goddesses. The main rituals performed by devotees consist of kartik snan (devotees and pilgrims take a holy dip early in the morning in the sacred water of Ganges during Kartika) and deepdan (offering of oil lighted lamps) in the honour of Goddess Ganga. 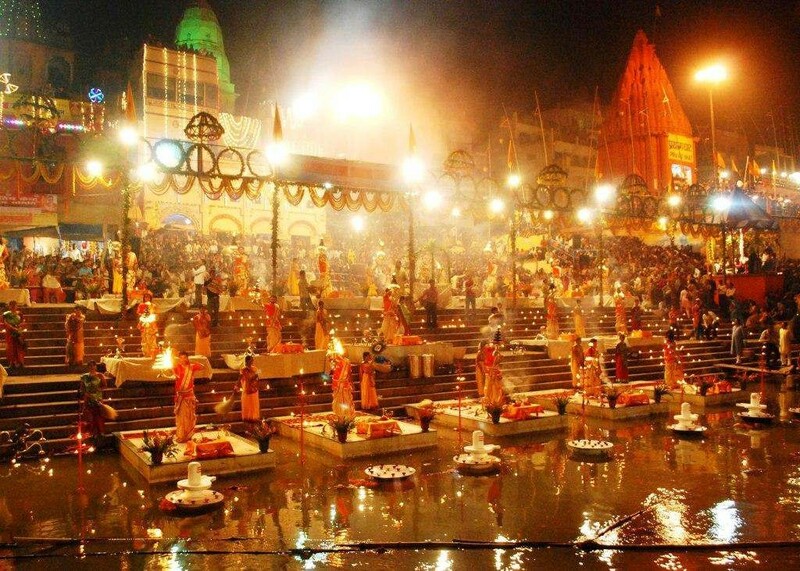 Ganga Mahotsav is a 5 day festival starting from Prabodhani Ekadashi to Kartik Poornima. Ganga Mahotsav is also held at Dasaswamedh Ghat (the famous Ganges ghat in Varanasi) on this occasion where a huge number of Hindu devotees start to visit the location, from the day of Prabodhini Ekadasi (eleventh day of fortnight). The entire ghats of the Ganga from Varuna to Assi is decorated with Diyas and floral rangolis on the eve of Kartik Poornima.Pilgrims let Diyas afloat in the water of the Ganges to welcome the Gods who are believed to descend on Earth. Following this, Ganga aarti is performed in the evening on each ghat of the Ganges, with huge lamps and is performed by 21 Brahmin Priests along with 24 girls, with full devotion. The Ganga Mahotsav ends with the grand celebrations of Dev Diwali. On this occasion of Dev Diwali, people decorate their houses with diyas. Colourful designs or rangoli are made on the front doors. Many houses organize Akhand Ramayan along with offering bhogs. Many devotees keep fast on this day and chant the Maha Mrityunjaya Mantra in multiples of 108 through the day. The world renowned Pushkar fair happens on this day, in Rajasthan. Many perform rituals and take a holy dip in the Pushkar lake. Next articleKartik Purnima: Significance, Legends, Rituals To Follow & Timings!